We’ve lived in our 1901 house in Northeast Minneapolis for over twenty years. In that time, we made numerous improvements on our own, but realized that the major improvements we wanted would never happen without help. We worked with an architect and builder to bring our home back to its roots and add functionality without changing the footprint. Our project started with the intention of addressing flow issues at the house’s entrances but ended in a near whole-house renovation. Gone were the outdated drop ceilings, odd stairways, and a bathroom that doubled as a hallway. 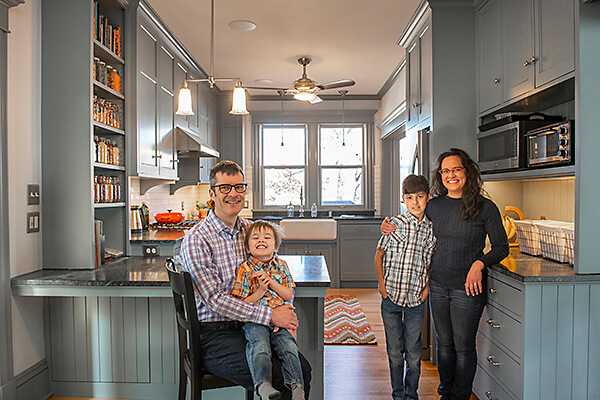 In their place: proper woodwork, a beautiful kitchen, second floor laundry, updated bathroom, new fireplace, and built-ins that define entryways and keep things organized throughout.